It was a warm summer morning. I usually listen to some kind of interview or business audio but not that morning. It was 5:45AM and it was Outkast blasting through my speakers as I pulled into the Allatoona High School parking lot. My campers, aka warriors, were ready to face the battle against the bulge. I got numerous looks as I laid out the piece of paper on the ground showing today’s epic metabolic bootcamp finisher. As we knocked out rep after rep of the workout, sweat was pouring from their faces. Some had even turned red. Finally, we completed the final circuit of the main workout. It was a brutal metabolic conditioning circuit. We were just halfway through our 14-Day Bootcamp Fat Torch program, in which I held only 3-4 times a year. I usually never offered it during the summer, but my campers wanted it to happen… those freaks. All of them gave it their all, including their homework assignments that I gave them directly from the manual on the days we didn’t meet. It was obvious that they were addicted to working out. After all, who wouldn’t be if you did something unorthodox at the end of every workout. It was those crazy rep and set schemes that kept my campers coming back for more week after week. The fat they torched was just a plus. It was an addiction to working out… and that’s the way uh-huh uh-huh I liked it. Because when you’re addicted, that means you’re consistent. Consistency = results. And now, you can, too. 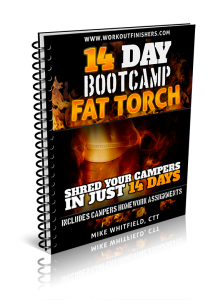 Whether you’re a bootcamp coach or just want to get addicted to working out again, use the combination of the 14-day Fat Torch program and finishes, and you’ll be burning fat fast and getting addicted, too. Plus, you’ll get the 14-Day Fat Torch program AND Metabolic Switch as exclusive bonuses. Now go smack belly at in the face.